This is a report on our evaluation of using some language resources for the Indonesian-English bilingual task of the 2007 Cross-Language Evaluation Forum (CLEF). We chose to translate an Indonesian query set into English using machine translation, transitive translation, and parallel corpus-based techniques. 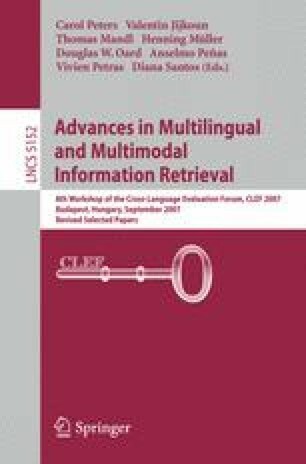 We also made an attempt to improve the retrieval effectiveness using a query expansion technique. The result shows that the best retrieval performance was achieved by combining the machine translation technique and the query expansion technique.